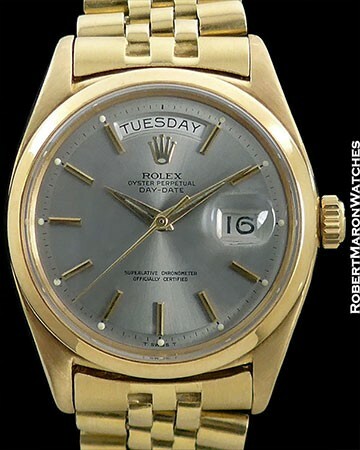 This is a very rare vintage Day Date. The reference 6611 is the “standard” early Day Date with its fluted bezel. This reference 6612 has original born on the watch smooth bezel. Watch is in mint condition with stunning gray pie pan dial and original golden dauphine hands. 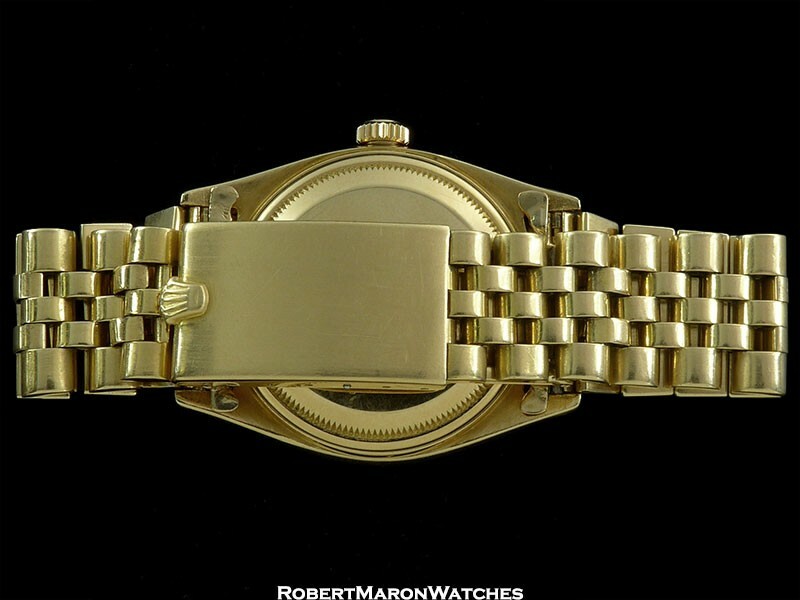 Original 18k gold case measures 36mm diameter by 12.3mm thick. The case is not the same as on the later 1803 Day Dates. This case is more like a Bubble Back case with protruding solid 18k screw down case back. 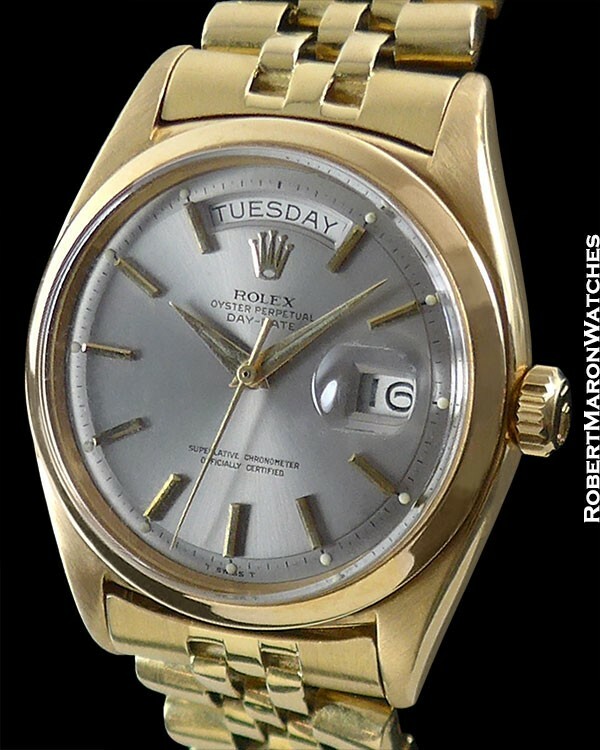 The smooth bezel not only looks great, it also makes this watch very rare and an important vintage Rolex. It’s a must have watch if you are a Day Date collector. Inside case back is marked at the factory with both ‘6611’ and ‘6612’ which is unusual and very cool. Rare gray pie pan dial with radial brush finish, applied hour markers and gorgeous original golden dauphine hands. The hands have a narrow area carved out for luminous. 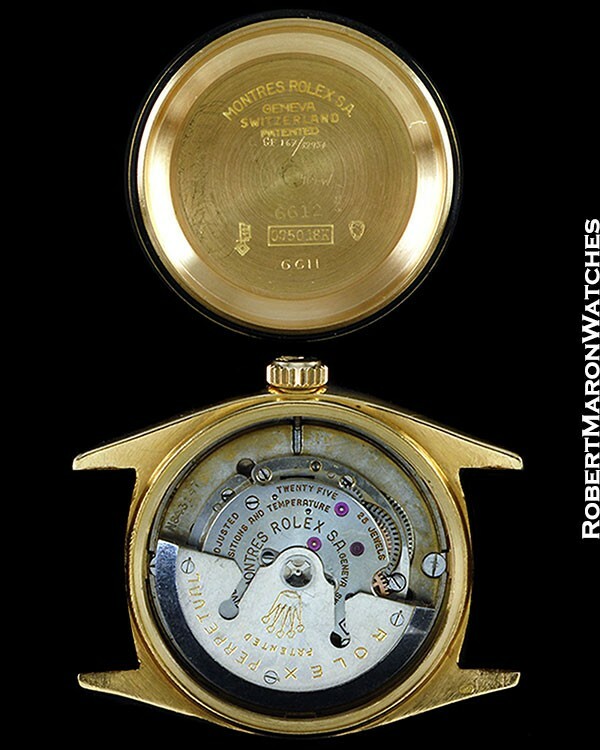 Original automatic winding Rolex Caliber 1065 with 25 jewels and adjusted to temperature and in five positions. This C.O.S.C. Certified Chronometer movement is clean and keeping good time. This mint condition and rare vintage Day Date President will be delivered on a new high quality leather strap with Rolex buckle.